Palmer, who also scored 22 points in Sunday’s 66-53 LIU (19-7, 8-6 in the NEC) win over St. Francis (3-22, 2-12,) was named the most valuable player of the Battle of Brooklyn. “It felt great to be named MVP, but more importantly, we got the win tonight,” said Palmer. LIU broke the game open early in the first half when they went on a 15-0 run, including eight of Palmer’s 17 first half points. The Lady Blackbirds were able to capitalize on a combination of poor shooting as well as sloppy ball-handling by St. Francis. The Lady Terriers shot 19-percent from the field until 2:15 of the first half. Eight turnover by St. Francis also led to eight points for LIU. St. Francis fought hard to keep LIU’s lead under 10 points before halftime, but Palmer emerged again, extending a 27-20 lead by scoring five unanswered points to close out the first half. The Lady Terriers looked like an entirely different team in the second half, shooting 43.5-percent from the field as well as drawing more fouls. 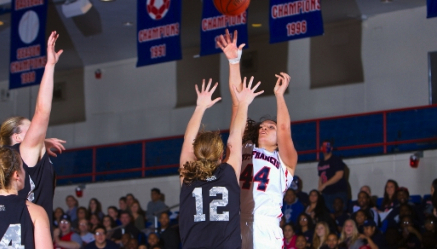 St. Francis drew 17 fouls in the second half largely due to more aggressive play on offense. Down 48-40 with 6:07 left in the game, St. Francis began to rally, going on an 11-4 run to bring the game within a point for St. Francis. Robinson, however, missed a potential game-tying free throw and LIU was able to finish the game on a strong 8-1 run, including back-to-back layups by Palmer which preserved the game for LIU. “I know what I have to do in those situations,” said Palmer. Two Lady Terriers scored in double digits, including a team-high 17 points by Robinson. Forward Sarah Benedetti finished just shy of a double-double with 11 points and seven rebounds. St. Francis will play their final home game of the season on Saturday, Feb. 18 against Sacred Heart University at 4 p.m.
LIU broke the game open against St. Francis by going on an early 15-0 run as the Terriers were ice-cold from the field. The Lady Terriers took an early 4-0 lead off of a pair of layups by Jaymee Veney and Jessica Kaufman, but LIU’s offense awoke along with Ashley Palmer, who had 20 points in Sunday’s win over St. Francis. LIU has also punished St. Francis off of turnovers, scoring eight points when St. Francis mishandles the ball while the Lady Terriers have failed to score a point off of LIU’s four turnovers. St. Francis has also failed to make a three-point shot. Veney leads the Lady Terriers in scoring with seven points. Nobody else on the team has more than two. LIU also in foul trouble with seven team fould, St. Francis is in the single team bonus.